2017 marked Worksafe's 35th anniversary, and it's been an exciting year. We've grown our team, sharpened our focus, and collaborated with allies across the state to advance worker health and safety in California. 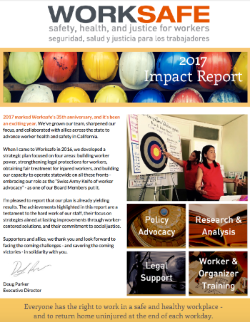 The achievements highlighted in this impact report are a testament to the hard work of our staff, their focus on strategies aimed at lasting improvements through worker-centered solutions, and their commitment to social justice. Supporters and allies, we thank you and look forward to facing the coming challenges - and savoring the coming victories - in solidarity with you!